Disparate Homeowners, longtime residents, advocacy groups and other stakeholders hijacked the discussion at Thursday night’s Metro community meeting concerning Metro owned properties in Boyle Heights. The meeting was supposed to be Metro’s sole opportunity to get community input before submitting design guidelines to the Metro board of directors for three sites – Cesar Chavez Avenue and Soto Street, Mariachi Plaza and Southeast Corner of Pennsylvania & Bailey, Soto and First Street. Instead, it turned into a nearly two hour venting session aimed at the Metro representatives over the lack, or excess, of affordable housing, the need of a pocket park on 1st Street and Lorena Avenue – which doesn’t seem like it could possibly happen under Metro’s plans – and the frequent heated public exchanges between the community and MTA. “That’s what was amazing tonight. The bulk of the conversation was about Lorena (Avenue and First Street site). And nobody said anything about out Mariachi, which shocked me,” said Greg Angelo, Metro’s director of real property management and development, after the meeting. From the more than 100 people that filled the Boyle Heights Senior Center, only a handful of individuals went into detail about needs for the sites being considered for commnunity input. Will Ramirez of Farmacia Ramiréz asked Metro to consider a parking structure on the Cesar Chavez Avenue/Soto Street site in order to create a park and ride for the Soto Street Gold Line Station. With the structure, Ramirez also recommended a walking path that connects the park-and-ride to the Gold Line station with better lighting, security. Jazmin Guzman, who lives in the Boyle Hotel, said that she would like a market in the area because there isn’t one. “When I go (to the market) I have to chose what I really need because I can’t carry it back home all by myself,” said Guzman. Metro, Angelo said, speculates that all three sites should have some component of a mixed use with commercial and retail space. Soto Street and Cesar Chavez is the only site that Metro speculates that it could have apartments. These expectations for the site from Metro is dependent on the chosen developer and the community input, added Angelo. Community members dialogue with the Metro representatives remained broad throughout the majority of the meeting. Leonardo Vilchis, cofounder of Union de Vecinos, started leading a chant in the crowd of “Casa para los pobres,” or houses for the poor. Diego Cardoso, executive officer for Metro transportation development and implementation, said after the meeting that he didn’t know before about the issue of including street vending within the sites. 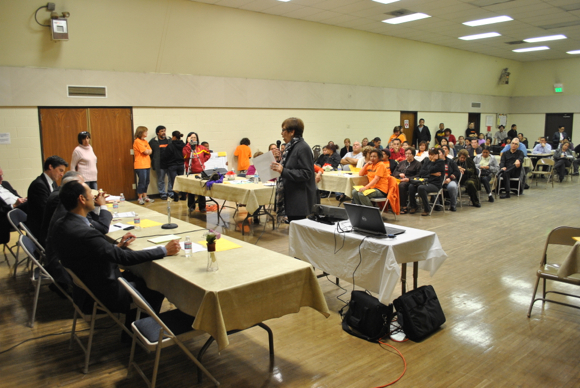 The presentations had a dialogue translator for Spanish speakers, but as Reina Fukuda, East Los Angeles Community Corporation community organizer, pointed out speaker cards were only in english. The sole idea with wide consensus from the audience was to place a pocket park at the vacant First Street and Lorena Avenue lot. But that isn’t happening either. “I agree that this area needs parks, no question, but that’s not what we (Metro) do,”said Roger S. Moliere, Metro’s chief of Real Property and Economic Development department, after the meeting. Also, Metro staff is already working on a proposal with developer A Community of Friends that would include affordable housing units. The land that Metro owns, Moliere said, needs to be used to improve transit quality, and a park wouldn’t fall in that category. The Metro representatives at the meeting will debrief and plan to have another meeting, but nothing was confirmed.